The temporomandibular joint is the point of connection between your lower jawbone and your skull. It is held together by muscles and cushioned by cartilage for chewing, talking, and yawning. When it functions properly it can move your jaw side to side and up and down smoothly and painlessly. When the muscles become irritated or the joint is affected by arthritis it can cause you a great deal of pain. People often confuse TMJ with the pain it causes. TMJ refers to the actual joint while the pain disorder is known as temporomandibular disorder or TMD. This disorder affects more women than men and could affect just one side of the face, or both. What Causes Temporomandibular Disorder (TMD)? This is the most common form of TMD. The muscles that control the jaw become irritated and inflamed. This is often caused by stress manifested in the grinding and clenching of teeth. It is common for this behaviour to happen in your sleep. Because of the interconnectedness of your muscle groups, this form often creates pain through your shoulder and neck. The temporomandibular joint is fitted together so the two pieces of your bone slide against each other comfortably along a piece of cartilage. If this joint or cartilage has been damaged by an impact, a fall, or a dislocation can cause this joint to function imperfectly creating pain. Arthritis or other degenerative joint diseases can affect your temporomandibular joint just as it causes pain in other major joints like your knees or fingers. The cartilage is broken down and new bone forms. Over time, diseases like this can cause bone deformity. Regardless of the type of TMD you are experiencing, the symptoms are often the same. For most people, temporomandibular disorder is not permanent. It’s important to understand the cause of your TMD, so the steps you take to relieve it are effective. A visit to the dentist will help you to understand what is going on. From there, you can take the right steps in alleviating the discomfort. While TMJ-related pain can feel like it’s unending there are ways to manage your TMD at home. Eating softer foods and avoiding large mouth movements can minimize the amount of pain you experience. Hot or cold packs can reduce inflammation and pain, while some stretching exercises may help to gently increase your range of motion. Prescription or non-prescription painkillers like non-steroidal anti-inflammatory drugs (NSAIDS) or muscle relaxants can offer some relief. In some cases, a visit to your chiropractor could be worth it. Some practitioners offer intraoral myofascial release, a technique that releases the tight muscles binding your joint. 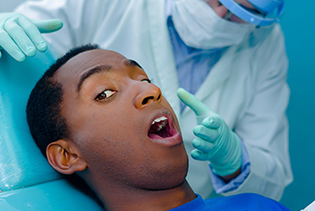 Your dentist can help you attain a mouth guard to protect your jaw from grinding overnight. Book an appointment now to talk to us about an appliance for your TMJ pain. There are a few exercises that can be beneficial to unravel that tension in your joint. Strengthening exercises are best when you are not in a great deal of pain, while stretching exercises may help to reduce the pain you are experiencing. By creating resistance in jaw movements you can create stronger jaw muscles. Avoid doing these exercises when you are experiencing a higher than normal level of discomfort. Opening Resistance: Place your thumb on your chin and push upward and you open your mouth. Hold this position with moderate pressure before closing your mouth and repeating. Closing Resistance: Alternatively, use your index finger in the ridge of your chin and create resistance as you close your mouth. Hold that position with pressure for a moment before opening your mouth and repeating the process. These stretches can be done anytime. They encourage lengthening of the muscles and can be performed even when you are in pain. Remember to move slowly. As with any stretches, the more frequent you perform them the more benefit you’re likely to experience from doing them. Opening Stretch: Beginning with a closed mouth and a relaxed jaw (teeth apart), slowly open your mouth until it is as wide as possible. Accentuate this by looking up with your eyes. Hold for a moment before slowly closing your mouth. Side-to-Side Stretch: With your mouth closed and jaw relaxed, move your jaw to the left as far as it will go, while looking right. Hold for a few seconds and return to centre. Repeat this by moving your jaw to the right and looking to your left. Then return your jaw to the centre. When stress is the culprit behind your TMD, relaxation exercises are a good choice. If you feel you are tense, first relax your jaw before taking deep, measured breaths. To ensure your jaw is relaxed, blow air out and allow your lips to vibrate visibly. Inhale for a count of five or 10, then exhale for a count of 10 or 15. Repeat as often as necessary.